What is early childhood music therapy? Does it help my child with disabilities? What costs and time commitments are involved for this therapeutic service? Is this for all children and families in our daycare center? These are just a few questions families, educators, counselors, allied health professionals, administrators and policy makers worldwide may ask. Participants will be encouraged to jot down their remaining questions for the Q&A Panel on Saturday afternoon. Valuable resources such as exclusive articles, handouts, checklists or podcasts published in the imagine.magazine, will be cited. Attendees can expect an interactive presentation including video and audio examples. 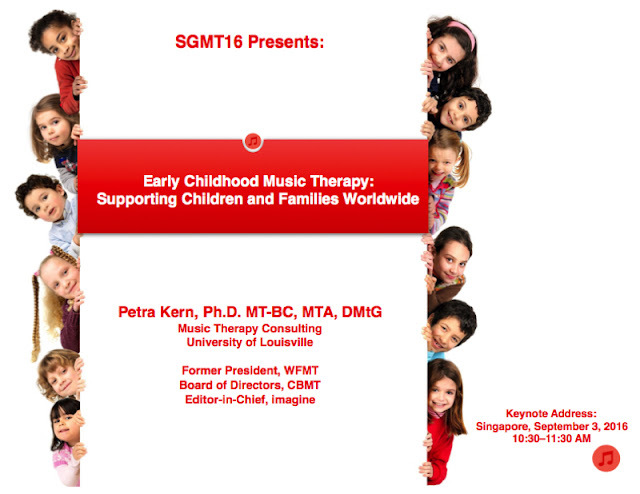 Come join Dr. Petra Kern for the first of three keynotes at SGMT16- Early Childhood Music Therapy- Supporting Children and Families Worldwide at the Academia on September 3, 2016 from 0930 to 1030 hrs!